True high-speed rail, in excess of 125 mph, requires dedicated electrified passenger tracks that are grade separated from roads and other rails. The speed at which a train can travel is limited by the type of track it travels on. Bringing high-speed rail to the Midwest will require building new high-speed lines that can accomodate frequent 200+ mph service. These new high-speed segments connect to and enhance our existing rail network. 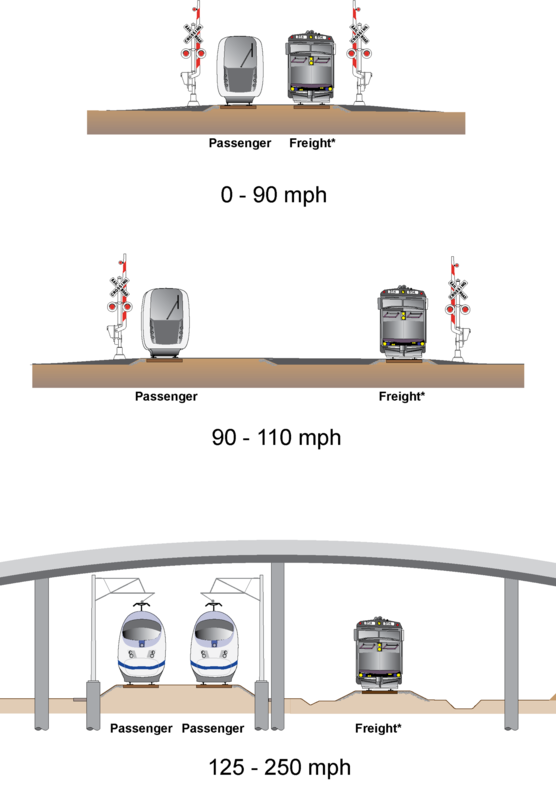 Modern trains can travel seamlessly from conventional track to high-speed track. They simply travel slower while on conventional track. Passenger service on the conventional freight rails that criss-cross the United States today is limited to 90 mph at best. Trains cannot reliably exceed 90 mph on track shared with freight trains, and are in most cases limited to 79 mph or less. To exceed 90 mph, passenger tracks must be separated from freight tracks. On a single dedicated passenger track (with occasional passing sidings), diesel-powered trains can travel up to 110 mph. Currently, Amtrak service through Michigan operates this way. To exceed 110 mph, safety regulations require the elimination of grade crossings, and to exceed 125 mph, trains should use overhead electric power. With dedicated passenger tracks that are grade-separated and electrified, the only limits to speed are the tightness of curves and the steepness of hills. Thus, high-speed lines tend to be relatively straight and flat. By building segments of high-speed line that are long enough to let trains go really fast for significant portions of their journey, we start to see the dramatic reductions in travel time that makes high-speed rail competitive with driving and flying.